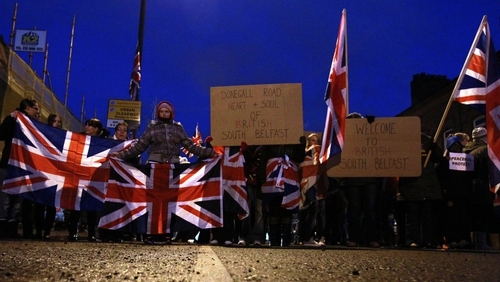 Bullets have been sent to five Northern Ireland politicians in an escalation of the loyalist street protests. Sinn Fein and cross-community Alliance Party public representatives were targeted in packages posted to Northern Ireland's legislative assembly at Stormont. A string of attacks against politicians has followed the decision to reduce the number of days on which the Union flag is flown from Belfast's City Hall. The change sparked sporadic loyalist violence and road blocks, which have continued for most of this month and blighted Belfast city centre trading in the run-up to Christmas. Gerry Kelly, Sinn Fein MLA for North Belfast, said: "This is obviously a step up in the attempt to intimidate elected representatives." Sinn Fein said letters containing bullets and addressed to assembly members Mr Kelly and Alex Maskey had been sent to Stormont. The Alliance Party said bullets were posted to party leader David Ford, East Belfast MP Naomi Long and councillor Gerardine Mulvenna. Mr Kelly said the threat was connected to the protests against the democratic decision taken at Belfast City Council. "This will not deflect Sinn Fein from our work of seeking parity of esteem when it comes to reflecting people`s Irishness and Britishness. Obviously protesters have been wound up prior to the decision in Belfast and those that have kept up the tension need to reflect on what they have created." Alliance party offices have been burned by arsonists in Carrickfergus, Co Antrim, and Ms Long and Mr Kelly have been the subject of death threats before during the recent period of unrest. A spokeswoman for the Police Service of Northern Ireland (PSNI) said: "Police are currently dealing with a number of suspicious packages which have been located in the postroom at Stormont." An Assembly spokesperson said: "A package was delivered to Parliament Buildings on Wednesday and intercepted by security staff. In line with standard procedures, the package has been passed to the PSNI." Unionist political leaders have unveiled proposals they hope will persuade loyalists to end their ongoing protests in Northern Ireland over flying the Union flag. Stormont First Minister and Democratic Unionist leader Peter Robinson and Ulster Unionist leader Mike Nesbitt are to set up a Stormont forum to focus on the flag issue and other areas of concern within loyalism. Representatives from within that community will be invited to attend and put their views across. The first meeting could be held before Christmas, but a more likely timetable would see proceedings convened early in the new year. The anticipated development was announced yesterday after another night of violent scenes across Northern Ireland on Monday linked to the flag dispute. More than 40 police officers have been injured in almost three weeks of disturbances - first triggered when Belfast City Council voted to reduce the number of days the Union flag flies at City Hall. Meanwhile, the Catholic Bishop of Down and Connor is the latest prominent church figure to comment on the unrest in Northern Ireland. In his Christmas message, Dr Noel Treanor described the ongoing civil unrest over the flying of the union flag at Belfast City Hall as one of the "lows" of 2012 and said old ghosts had returned to haunt the people of the diocese. In his Christmas message, Dr Treanor, is not specific about who is responsible for the ongoing civil unrest. He states that old ghosts, untamed and myopic tribal forces, have returned to haunt the people of the diocese on their streets and to menace their future. He also notes that this is happening despite the common Christian heritage and faith of most people in the diocese.